Once upon a time, during the days of old, long back when the twelve Gods first came into power and wanted to take over from the Titans, Rhea, daughter of Uranus (Heaven) and Gaia (Earth) mated with Cronus and gave birth to Poseidon. Afraid that her offspring was going to be caught in the war and killed, Rhea gave the baby to be brought up by the Telchines. Thought to be the first inhabitans of Rhodes (back when the land hadn't been called Rhodes yet...), the Telchines were an ancient, mysterious tribe, with origins from Frygia in Grete or Cyprus. Their name comes from the ancient Greek verb “thelgo”, meaning “to attract” or “to charm” and they were supposed to be great sorcerers. According to one source, they were the sons of Thalassa (Sea) and that's why they were very able mariners, a fact which is acutally historically well documented. The Telchines were also great technicians, particularly excelling at the treatment of metal: as the legend goes, they had forged Cronus' slythe and, later, Poseidon's trident. They were also mason artists, creating the first statues dedicated to the Gods. During her sail to Cyprus, Aphrodite ran into a sea storm right outside Rhodes. She tried to approach the island, but the Telchines did not allow her ship to enter their port. Furious by this extreme insult, Aphrodite cursed the Telchines who saw their sorcery abilities grow ever stronger, to the point of insanity: they could now control the weather, bringing unstoppable rain and hail that destroyed their island. And much worse than that: they became manic to the point that they violated their own mother. 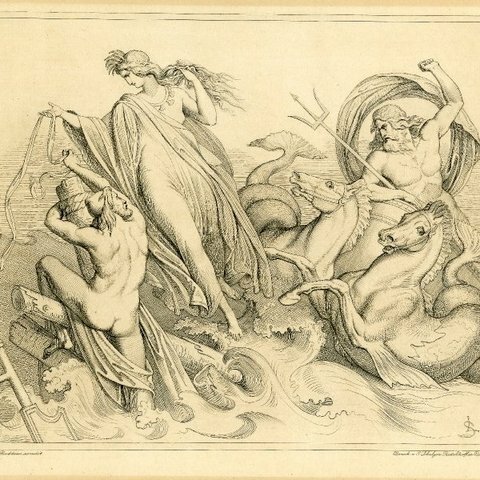 Seeing all this destruction and insanity, Poseidon got really angry and buried the Telchines deep into the ground, while Alia, their sister, threw herself in the sea out of her sorrow and drowned. She had since been worshipped by the name of Lefkothea by the Rhodean people. Witnessing the desolation of their island, the plain people of Rhodes decided to flee, leaving the place empty. Historically, this flight might be linked to the destruction of the Minoan civilization by the eruption of the volcano in Santorini: people afraid of a great flood tend to forsake island settlements. The fate of Rhode herself is, at this point of the story, unknown. Her brothers, the Telchines, had since been thought of as amphibious fiends, inhabiting the bowels of the earth and jumping out of erupting volcanos... In the meantime, the twelve Gods had been really going at it against the Titans, meaning to take over the rule of the world. Helios (Sun) helped them in their battles and, in return, was awarded a place in the new division of territories. But, he happened to be away from Olympus, when the rest of the Gods distributed the spoils, and so was left with no territory to rule over. But Zeus would not have than. So, he promised Helios that we would appoint him as ruler of the next land to emerge out of the sea. Kouros luxury hotel in Rhodes. Click here and book online! I just so happened that, at that exact moment, a certain island that had been submerged (for the reasons discussed above), re-emerged on the sea's surface in the form of the nymph Rhode, who had been left there alone, beautiful and soaking wet. Helios fell instantly in love with her, dried her up from the water with his warm sunbeams and they lived together ever since. Rhode bore Helios seven sons and one daughter. Their oldest son, Kerkofos, went on to have three sons of his own: Kaminos, Ialysos and Lindos, who divided Rhodes up into regions to rule over, giving them their names. Recognizing the dominion of Helios on the island, its people held him in great reverence and worshipped him as their patron God. The famous Colossus of Rhodes, the giant statue which has been considered one of the Seven Wonders of the ancient world, was dedicated to Helios. 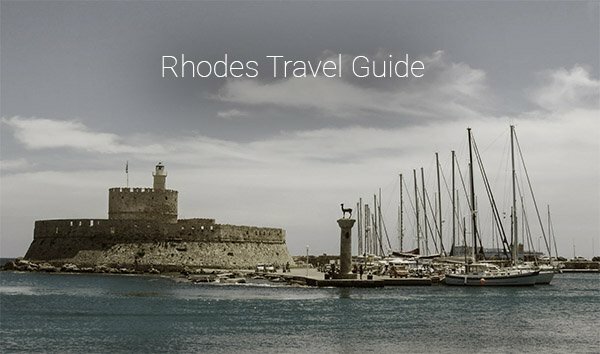 Respectively, Rhodes is said to have been blessed with year-round sunshine, as well as with gifts from two more very important Gods, as acknowledgement of Helios' help during the fight with the Titans: Zeus sent golden rain upon Rhodes, providing its inhabitants with great wealth, while Athena blessed them with the gift of art and craft-making, embelishing their island with beautiful works of art. Which brings us all the way round to the Telchines and their artistic abilities.